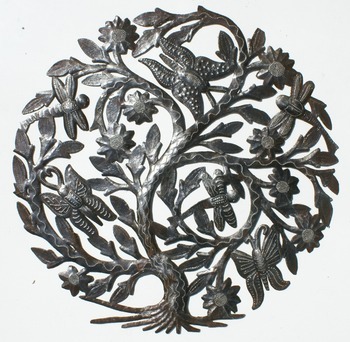 Metal tree of life with butterflies and dragonflies, not painted handmade tree with design of natural metal color, hand crafted in Croix des Bouquets, Haiti, handmade by local artists of recycled steel oil drums. Round. Size 60cm (24").